In 1964, Peter Belin established the Belin Arts Scholarship, in memory of his father, F. Lammot Belin. The scholarship was endowed with funds provided by the Belin family and has become a prestigious annual award. Peter and Mary Belin were both prominent philanthropists, active in the Washington DC performing arts community. Peter Belin passed away on February 23, 1982 at age 69. 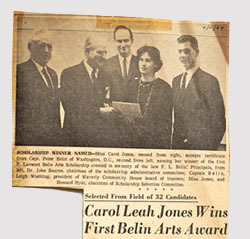 For almost half a century the Belin Arts Scholarship has funded the noble arts of painting, sculpture, photography, music, drama, dance, literature, and architecture, helping to bring success to the fortunate recipients, as well as joy to an appreciative public. The Scholarship award is in the amount of up to $12,000. Talent of qualified applicants is the determination of the Selection Committee as governed by the Board of Trustees of The Waverly Community House. Award applicants must have resided in Northeast Pennsylvania at some point in their lives and must provide evidence that their chosen field is intended to be his or her life’s work. The Scholarship was established to provide financial assistance to artists of outstanding aptitude and promise in the fine arts. 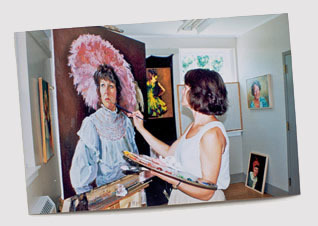 It is intended to aid the recipients in their development into professional artists. The recipient may use the money for formal or informal study or travel conducted according to an individual program or proposal which has had the prior approval by the Selection Committee through the application process.